Here is a color chart of the colors we offer! Here at Competitive Edge Metal Roofing we offer a wide variety of colors to be installed on your new Roof, we use high quality Metal manufactured by Experty manufacturers and order factory direct to offer you the most affordable prices on metal roofing today! Our Metal can be delivered to the job 2-3 days from the time it is ordered so we can offer quick installation to accommodate anyones time frame, here is a list of colors as well as the reflectiveness of each of those colors! 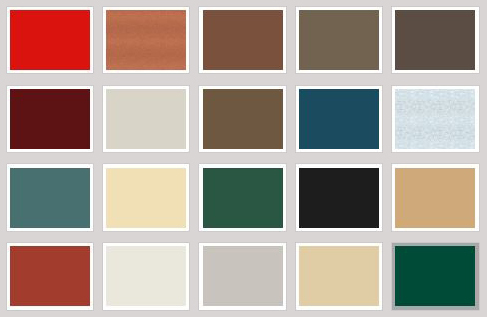 Click Below to bring up a full list with all color information! Metal Color options and Reflectivity!